Earlier this week, the Dubai Police rolled out its newest cruiser, a Lamborghini Aventador, and said it would be adding a Ferrari to the fleet to complement the Lambo. That Ferrari is an all-wheel drive FF. Dubai’s finest posted photos of the Ferrari in green-and-white police livery on Twitter, and it looks just as surreal as the Lamborghini. Like the Aventador, the FF will probably serve as a tourist attraction first and an everyday police car second, but at least it’s more practical. That hatchback gives it a decent sized trunk, for a supercar, perfect for hauling police equipment. Whatever function the FF performs, it will do it quickly. Under the hood is a 6.3-liter V12, producing 651 horsepower and 504 pound-feet of torque. It’s coupled to a seven-speed dual-clutch transmission and Ferrari’s first ever all-wheel drive system. 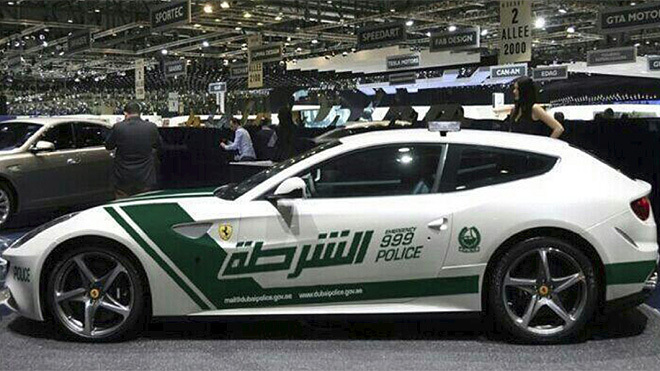 Dubai’s newest police car will do 0 to 60 mph in 3.7 seconds and reach a top speed of 208 mph. The Ferrari FF joins the aforementioned Lamborghini Aventador and a Chevrolet Camaro SS in what has to be the most badass police car pool in the world. The only question is: Where does the Dubai Police go from here? A Bugatti Veyron?